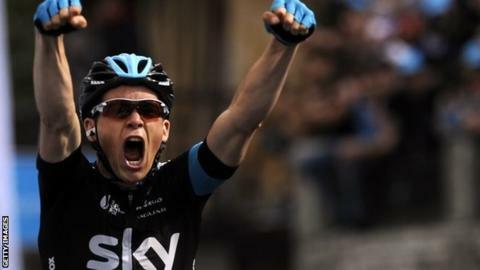 Ben Swift and Peter Kennaugh will be Team Sky's British riders at the Giro d'Italia after Sir Bradley Wiggins and Chris Froome were, as expected, left out of their nine-man squad. Froome is preparing for the defence of his Tour de France title in July, while Wiggins is racing in California. Belfast hosts the start on 9 May with two stages in Northern Ireland and one crossing into the Republic of Ireland. The 21-stage race then heads to Italy and finishes in Trieste on 1 June. Last week, British road race champion Mark Cavendish said he would also miss the Giro. The Manxman, who rides for the Omega Pharma-Quick-Step team, will instead ride the tours of Turkey, California and Switzerland in preparation for the Tour de France.